On your turn, you must take a tile from either the nine Region tiles in the center of the table OR the available God tiles (only one God tile may be taken per player throughout the game). Every time you take a Region tile, worshippers of the same color as the tile taken are placed on adjacent tiles, making the tiles left behind more enticing for the next player. 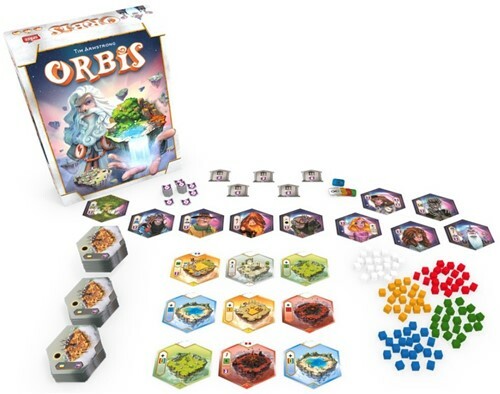 Restrictions apply to Region tile placement, making each decision tougher than the last! 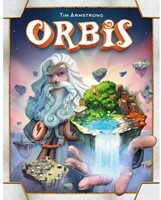 In just fifteen rounds, the game ends when all players have created their universe, at which point Creation Points are calculated, bonus tiles awarded, and a winner is crowned. 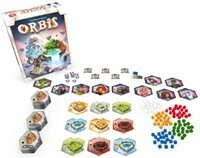 Beautifully simple yet rich in strategy, Orbis is a different game each and every time you play it.